I'm fortunate for where I live. I have 2 card shops within 10 miles of my house, along with two Walmarts, 2 Targets and a Meijers. There is also a biweekly card show about 30 min away in my old stomping grounds. That show was today. However, when I was confirming the date of the show last weekend, I noticed on the Beckett calendar a show closer to my house in Morris. It was smaller (30 tables compared to 70), but it was free. I talked my wife into a gondola at Corleone's and went to the show. Never was the phrase "you get what you pay for" more evident. This show was......not that good. Very overpriced. Not a dime box to be seen, and the stuff in the quarter box wasn't that great. At this show, I spent just $15. Here's what I got for my money. 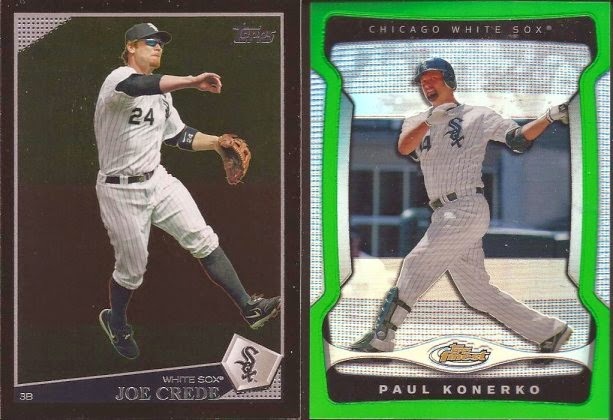 I needed the Crede for my player collection, and the Paulie is numbered to /99. A buck 33 there. 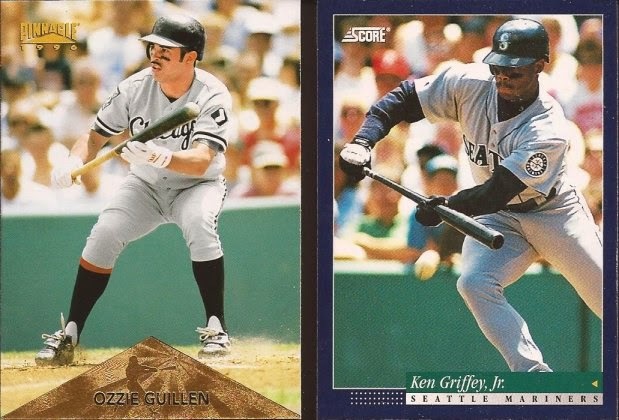 Two bunting cards for 67 cents (yeah - it was 3 for a dollar with the Crede). Too bad I didn't need either of them. A buck each for the Baracks. They fit into the political card binder. That Aparicio was four bucks. I picked up a Dayan Viciedo Triple Threads gold redemption for $5 from the same guy. It's already on the way from Topps. So that's all I got for $15 and about an hour of my time. Disappointed. 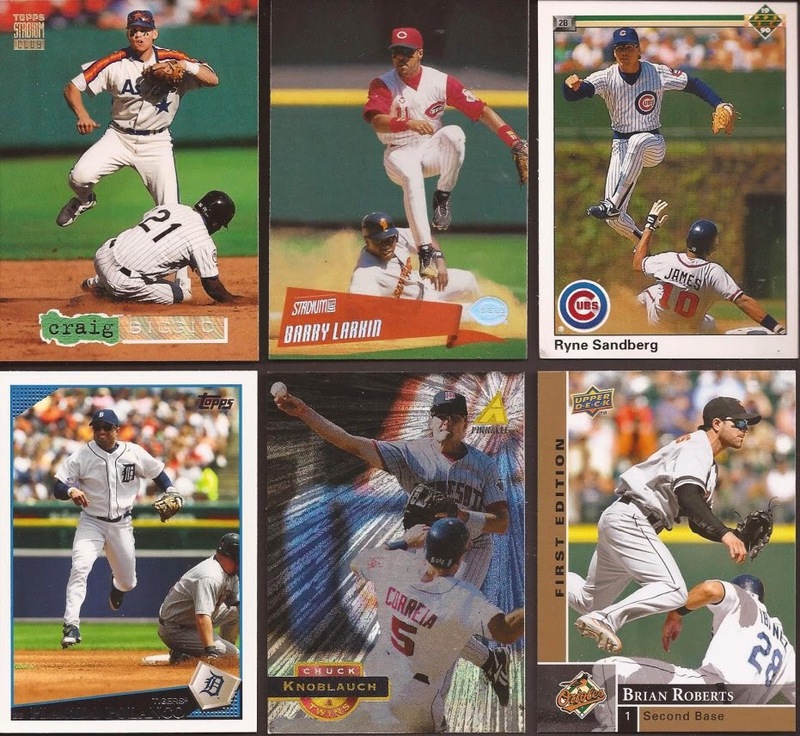 A whole bunch of White Sox cards. That AJ is gold foil, btw. The rest of the nickel cards I picked up (46 of them) are for some of you readers. 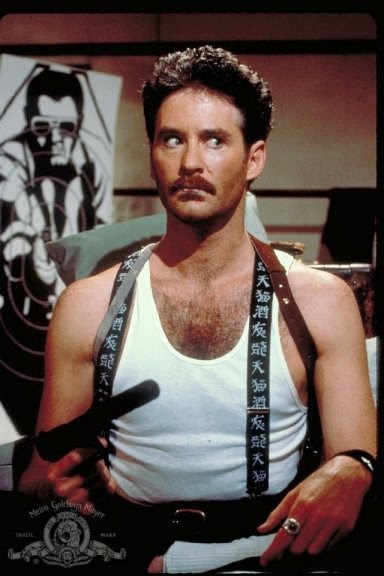 So you cheap jerks owe me $2.30 - PAY UP! As I said, $5 of nickel cards (100 of them). The other $5 I dropped on this vendor went for a Chris Getz auto for a dollar (I was too lazy to scan it) and these three. A Mattingly pseudo throwback, as that uniform was only worn for the photo, but good enough for my binder. 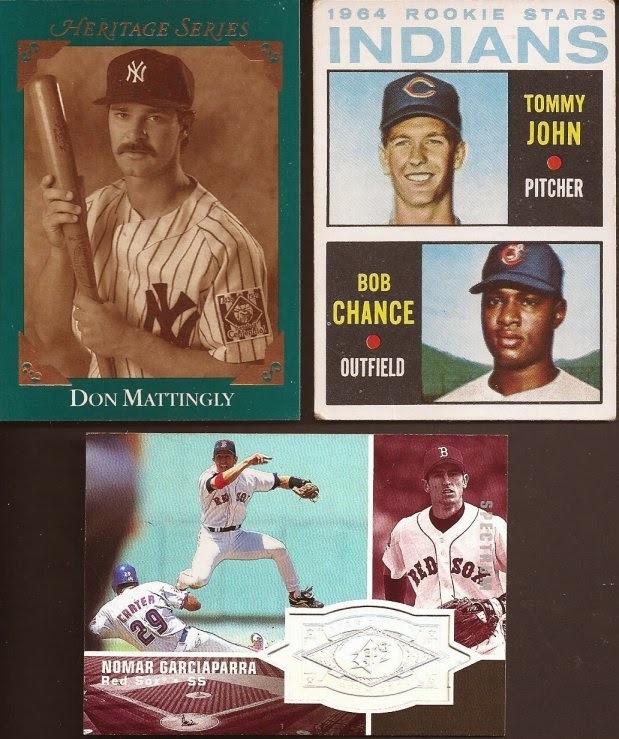 A nice serialed NOOOO-MAR, and that rookie card of Tommy John set me back $3. So, what would I categorize as my card show blaster? Here's $25 of vintage. Not shown is a dupe of the 64 Fox. One for the project and one for the 64 set. When you break it down, each card cost me $3.57. Fits right into recent Ebay sales, but I didn't pay for shipping. I'll take a seven card blaster any day when it's seven cards like this. I can say I will not be returning to Morris anytime soon. Nice Tommy J. I'm going to get one of those someday ! I think I've seen a quarter box maybe once in my life. I'm with NO on the Rivers. 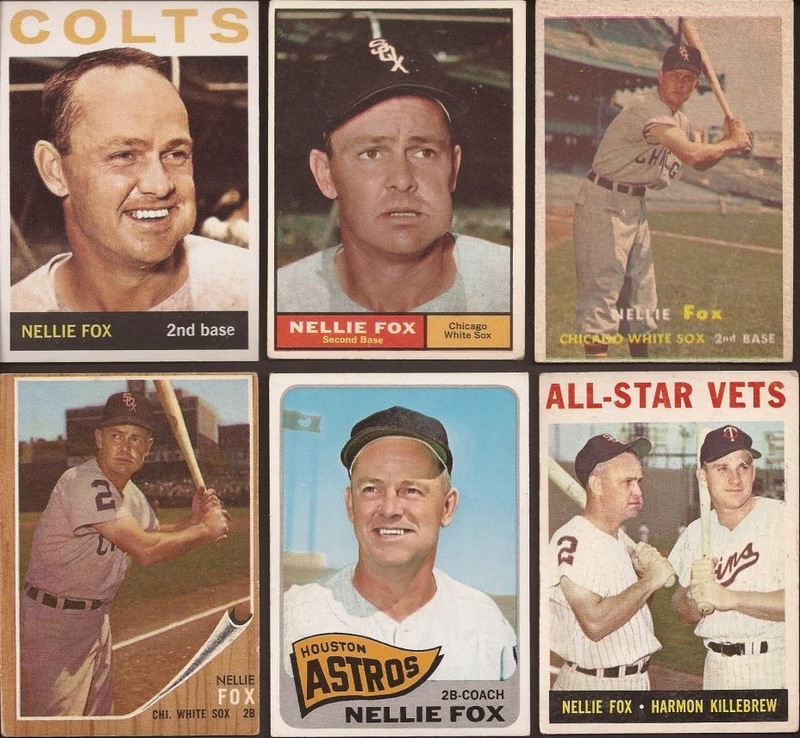 Those Nellie Fox cards are awesome as well. Money permitting, I'm hoping to return to the Orland Park show sometime this summer. The last time was a blast and I've been dying to go back ever since. I sent you a portion of the $2.30 from that nickel box. So I'm officially NOT a cheap jerk. I was going to comment on how awesome the Rivers is... but I'm 3rd to that party.